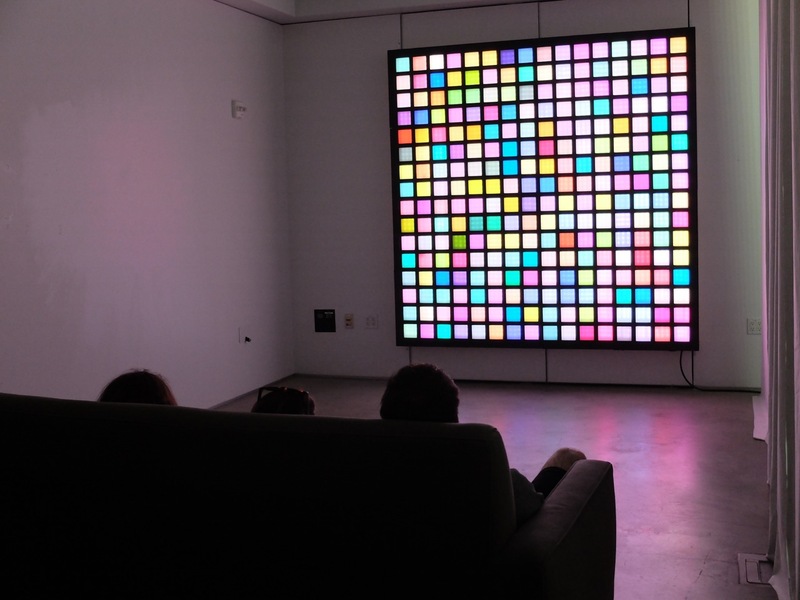 “Edges of Color” shows a series of individually programmed pieces on an 8’ square, 16×16 grid of separately controlled and colored LED swatches. Reminiscent of the color swatch paintings of Gerhard Richter or the spot paintings of Damian Hirst, it treats light as the material for display instead of paint. The pieces shown in the color pixel array explore the boundaries of what is possible in a rule-bound, constrained system, reflecting and criticizing notions of creativity, innovation, and conformism as they exist in Silicon Valley culture and the processes of science and technology today. A little known fact is that the range of colors that can be displayed via standard CMYK four-color printing processes and colors displayed as RGB light mixtures are not the same. There are “off-gamut” colors that can’t be displayed in a particular form. Unprintable Colors explores the color space that is off-gamut to CMYK printing. Some of renowned German artist Gerhard Richter’s color swatch works were ostensibly made of randomly chosen paint colors. However, the human mind is extremely poor at generating or recognizing random sequences in any form. The Random Richters piece shows an ever-evolving truly random selection of colored pixels, with the randomness generated by quantum mechanical physical processes. Pink is one of the few named colors that do not have corresponding single wavelengths of light associated with them and it is also one of the most emotionally charged colors in Western culture due to its common association with femininity, and a color not often chosen for hardware or software display in the male-dominated tech culture. Most colors can be represented as a single wavelength, or frequency, chosen from the optical spectrum, most commonly represented in a physical rainbow. Pink exists only as a mixture of red and blue wavelengths and is observed by the brain as a mixture of the signals picked by up red and blue color receptors in the eye. Pink Perceptions dynamically morphs between pure red and pure blue via pink in a slowly changing color sequence that activates the eye’s color receptors in turn and in combination. A landmark digital media artwork is John F. Simon Jr.’s Every Icon (1997), which, by the process of binary enumeration, generates every possible black and white icon. Every RGB Icon recreated the theme of this work but by showing every possible colored icon in a 16×16 grid. Instead of each pixel have one of two values in Simon’s work, the color version has each pixel taking one of more than 16 million values. The total running time of this enumeration is so long that even the lifetime of the universe so far (~13.7 billion years) is minuscule in comparison. In fact, if the piece started running at the time of the Big Bang 13.8 million years ago, it would still be part way through the first of the 16 rows on the display. The power of exponential growth is so unfathomable to human minds that numbers and times on this scale are beyond any kind of true human comprehension or timescale. This piece alone shows that the potential of color investigation is so vast that it goes beyond what humans can fully consciously comprehend. People develop strong emotional reactions to color and color combinations even to the point of them expressing “ownership” of colors or color palettes. Some of these are most readily observed on the Colour Lovers website. The Colour Lovers piece shows the most-loved color palettes, as created by and voted on by users of the Colour Lovers site. The piece shows the five most-loved palettes of all time. The top palette is created and named “Giant Goldfish” by user manekineko. It consists of two custom colors by manekineko along with three colors defined by other users. Manekineko has over 3000 followers who are notified of his new colors and palettes.